Artificial Intelligence is a computer system which performs tasks that requires human intelligence which is powered by machine learning and some are powered by deep learning. John McCarthy, who is known as the father of Artificial Intelligence. It is a way of producing a computer, software thinks intelligently or computer-controlled robot. Why KaaShiv InfoTech Company to learn Artificial Intelligence Training in Chennai? 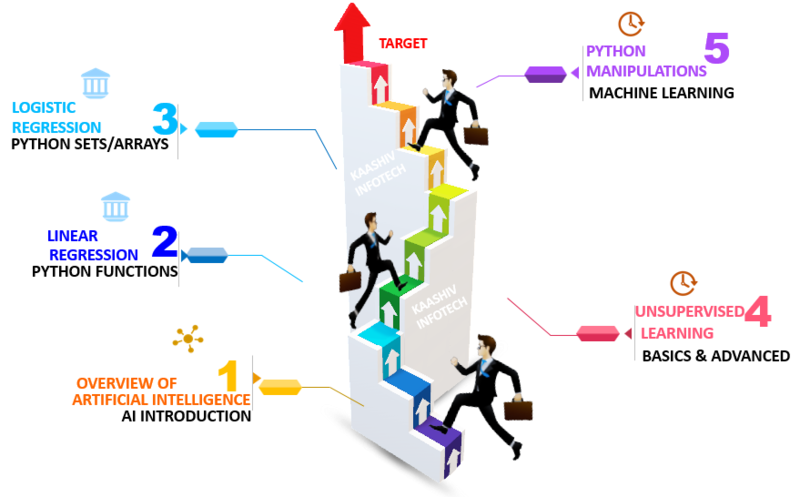 Kaashiv provides Best Artificial Intelligence Training in Chennai with professional trainers who provide real-time training and also projects to the candidates for better understanding. Why Students Enroll for real time Artificial Intelligence Course ? Artificial Intelligence is used in some fields like medical diagnostics, quantum science. The scope of Artificial Intelligence is to solve problems effectively as humans. We provide AI training in Chennai with experts and students will become trained professionals in this technology. Students from 1st Years / 2ndYears / 3rd Years / 4th Years / Passed Outs / Freshers and Professionals interested to learn. For Artificial Intelligence Training 120 concepts from Basic to Advanced will be covered.